KIGALI / JOHANNESBURG – Efforts by South Africa and Rwanda to revive diplomatic ties have suffered a setback after Johannesburg recalled its ambassador to Kigali amid allegations that Rwanda government media insulted South Africa Foreign Affairs minister Lindiwe Sisulu. The two countries have been working to revive diplomatic ties that deteriorated after the murder of the former Rwandan head of External Intelligence, Col Patrick Karegeya, in Johannesburg and attempts on the life of Gen Kayumba Nyamwasa, the dissident former Rwanda Army Chief of Staff, who is exiled in South Africa. As part of attempts to restore the relations, Ms Sisulu has been seeking to bring Gen Nyamwasa and Kigali to roundtable talks. However, sections of media in Rwanda that support the ruling Rwanda Patriotic Front party led by Paul Kagame have since accused the South Africa Foreign Affairs minister of being a traitor and being in cohort with opposition leaders in Rwanda who are seeking to overthrow the government. The stories have been published in Rushyashya, a tabloid that publishes in Kinyarwanda. According to The East African newspaper, several Rwandan government officials, including Foreign minister Richard Sezibera and his deputy Nduhungirehe, have also spoken out strongly against Ms Sisulu’s suggestion of talks with Gen Nyamwasa, who they describe as a ‘criminal’. The news is said to have infuriated President Cyril Ramaphosa’s government, which has since recalled its ambassador to Kigali while at the same time also summoning Rwanda’s High Commissioner to South Africa, Mr Vincent Karega to the Department of International Relations and Cooperation headquarters in Pretoria, to explain the insults. “That process requires that we must have reviews and assessments. And yes; we are not happy with the social media insults from the deputy minister and we have expressed that to the Rwandan High Commissioner in South Africa last week. We called him in,” South Africa’s Foreign ministry’s spokesman Ndibhuwo Mabaya is quoted as saying in the Daily Maverick, a South African newspaper. “Our High Commissioner also met with the authorities in Kigali before he came back for consultations. He indicated that we are very unhappy with the tone of the social media posts and that we want them to stop immediately. They are undiplomatic and foreign to our relationship,” Mr Mabaya adds. Diplomatic ties between South Africa and Rwanda broke down in 2014 after an attempt on the life of the exiled Gen Nyamwasa, leading to South Africa expelling Rwandan diplomats. Rwanda retaliated by sending home South African diplomats. 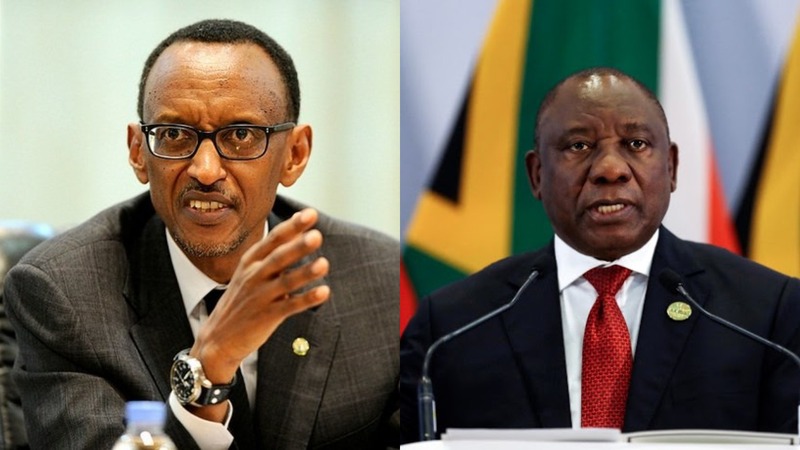 Presidents Kagame and Ramaphosa met on the eve of the G20 Summit in Buenos Aires, Argentina two weeks ago and, among other things, discussed ties between the two countries.